The biggest challenge for British universities is that its top two source countries — China and India — are not driving enrollment growth. These two countries account for over one-third of the total international student enrollment in the country. For the last four years, the overall enrollment for China has grown at a much slower pace (compared to the US), while India has been experiencing a consistent decline. While the UK has an advantage over the US in attracting international students from Nigeria, Malaysia, and Hong Kong, it cannot underestimate the Indian market because of its scale and growth potential. UK faces stiff competition for Indian students from the US, which experienced a dramatic increase in the number of Indian students primarily in Engineering and Computer Science fields. With Brexit, post-graduation employment and immigration opportunities will become more restricted. It will likely hurt the enrollment for master’s programs for non-EU international students and undergraduate programs for EU students. Despite the high quality and reliable reputation of the British higher education system, unwelcoming immigration policies are very likely to hurt the UK’s attractiveness as a study abroad destination. British universities rely heavily on international students to meeting their enrollment goals. Competing destinations like Australia and Canada with more welcoming immigration policies may benefit from this turbulence. US higher education is also facing a tougher environment for attracting international students for fall 2017. Three of the four top source countries — China, South Korea, and Saudi Arabia — are witnessing a slower rate of growth than in previous years. India was the only market among the top four countries that witnessed a double-digit growth rate. Indian students are value-seekers and hence they are concentrated in master’s programs, which offer a more likely chance of work experience through three-year long STEM Optional Practical Training (OPT). However, with the recent demonetization of Indian currency and a perception of stricter immigration policies, Indian numbers are likely to be affected at the master’s level. 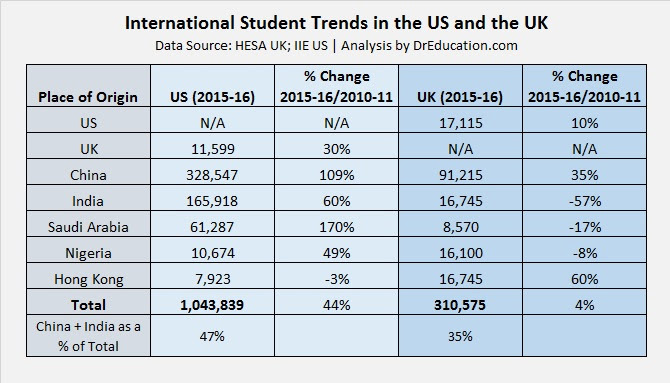 In a globally competitive market of international student recruitment, the outcome of the American presidential election seems like a saving grace for UK universities. To some extent, the unfavorable perception of Brexit among international students has been “trumped” by the uncertainty of the American immigration policies and its implications on work opportunities.